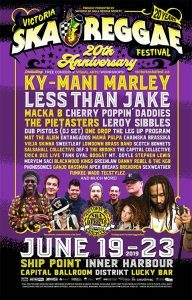 Bob Marley’s son Ky-Mani Marley will headline the 20th annual Victoria Ska & Reggae Festival along with Less Than Jake, Macka B and Cherry Poppin’ Daddies. The festival lineup was announced Monday morning. The 2019 Victoria Ska & Reggae Fest takes place Wednesday June 19 to Sunday June 23, 2019 at Ship Point, Capital Ballroom, Distrikt Nightclub and Lucky Bar.